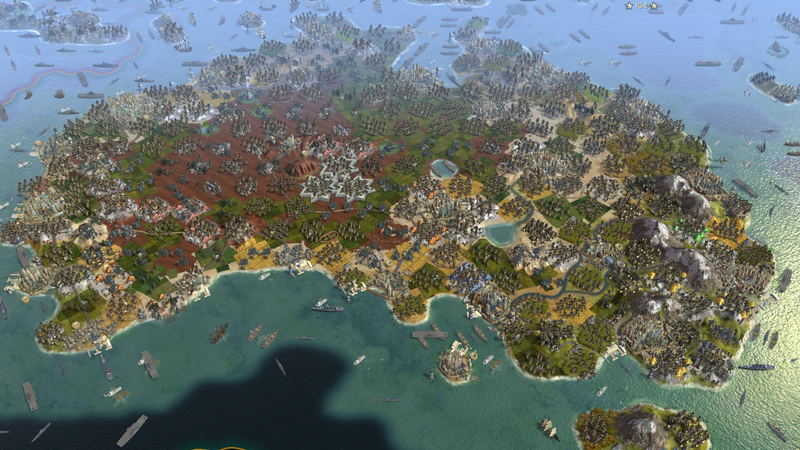 Civilization Battle Royale MK II is a huge ongoing simulation, with 61 AI players on a giant Civ 5 map of Earth. We wrote about the project before, and seeing some current shots of the map, without the UI, just further proves how crazy it is. Tpangolin, the creator of the project, used a mod that hides the UI, and as an extra, he took some screenshots of the latest turns of his simulation. That’s just Australia in the top shot. Here are other parts of the world, full of ships and military units, with some civs still using old galleys, and others already sailing with modern aircraft carriers. Without the distractions of the UI and other layers, it’s like a giant board game, with all available pieces in place.